Mirror photo by Patrick Waksmunski Brenda Fontinella pushes her son, Conor, 10, both of Coalport, in his new adaptive bike during a presentation by Variety at the Cambria County Courthouse on Wednesday. EBENSBURG — The Cambria County Courthouse may seem an unlikely venue for a bicycle parade, but, on Wednesday afternoon, a group of children road new bikes through its doors. Moments earlier, the children were gifted the bikes by Variety — The Children’s Charity, which is dedicated to helping children with disabilities. “All kids should have a chance to ride a bike,” Variety CEO Charles LaVallee said at the public presentation inside the courthouse. Variety officials were in attendance to present seven children with adaptive bikes and strollers, which cost $1,800 and $1,500 respectively. Variety is funded entirely by donations, and, since its 2012 inception, more than $3 million worth of equipment has been distributed to children, LaVallee said. On Wednesday, those children traveled to the courthouse from Blair, Cambria, Clearfield, Indiana and Somerset counties. And their guardians thanked Variety officials for the bikes and strollers and the benefits they’ll provide. Nurse Pat Fisher was in attendance with 10-year-old Kaycie Wills of Summerhill and her mother, Mandy McCarty. Fisher said the adaptive bikes help disabled children gain the attention and respect of their peers, who share a similar interest in riding bikes. Bill Dunsten of Windber accompanied his 9-year-old son, Daniel. The father said his son has often shared a desire to ride bikes alongside the children in his neighborhood. And Michele Seeya of Altoona said an adaptive stroller given to her daughter, Chayada “Amee” Seeya, will improve mobility. The mother said it’s difficult to make trips with her whole family because Amee’s wheelchair takes up a lot of room. That is not true with the stroller, which may allow a trip to the beach that Amee has been looking forward to. “You can’t do the beach in a wheelchair,” Michele Seeya said. The bikes can also be a confidence boost for the children, LaVallee said. LaVallee asked adults in attendance to remember their first bikes and what they felt when they learned to ride. Now, he said, those disabled children will have that experience, too. In addition to the bikes and strollers, Variety officials presented four other children with electronic communication devices, which will allow them to better communicate their feelings. 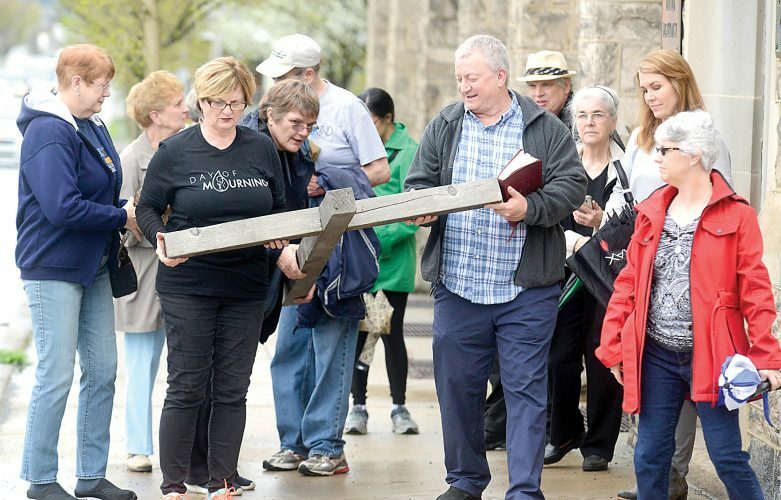 The tablet-like devices seemed to especially impress county Commissioner William “B.J.” Smith, who has a disabled child. The devices allow disabled children to press buttons on a screen to share feelings with their guardians, LaVallee said, later giving a presentation. “As a mom or dad, you want to know how much pain and where is the pain,” he said, explaining the device allows that type of communication. 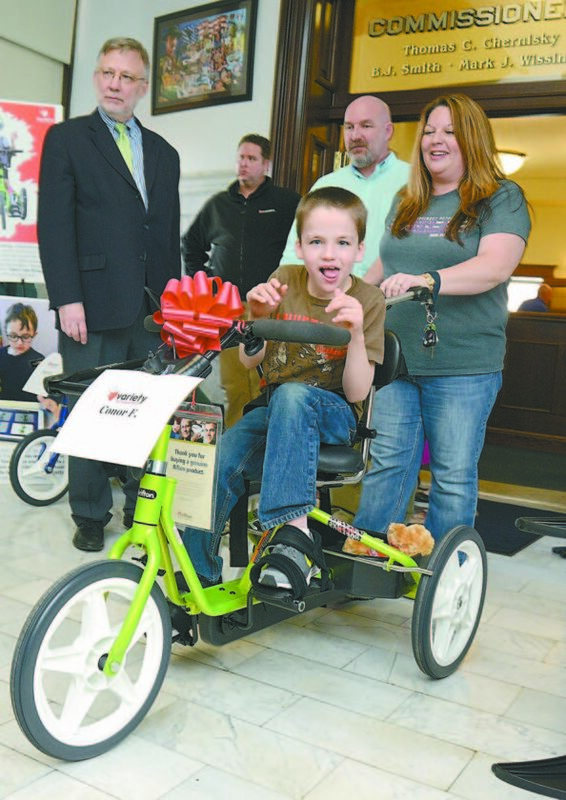 Following the presentation, President Commissioner Thomas Chernisky rode an adaptive bike through the courthouse and led a parade of children on bikes and in strollers out through its front doors.